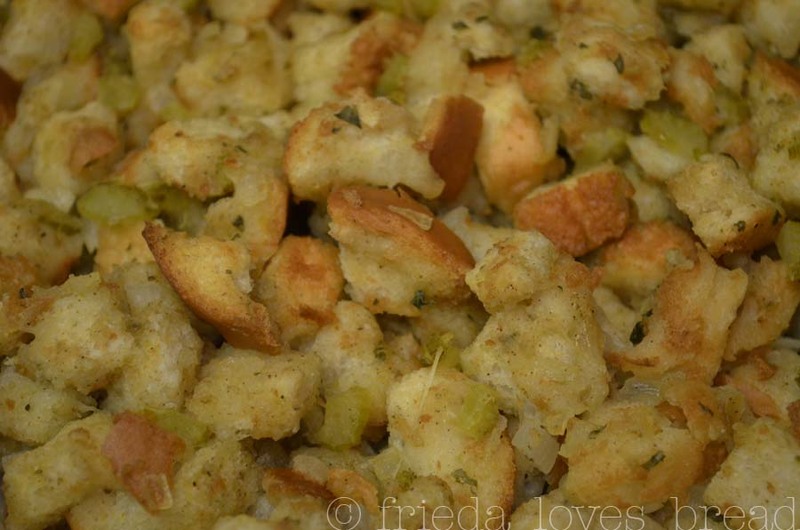 Frieda Loves Bread: Easy Classic Bread Stuffing...uh...er Dressing! 10 Easy Classic Bread Stuffing...uh...er Dressing! I ditched the box and made my own stuffing! I brought a sample to my mom. "This dressing is good..." she said. Dressing? Oh, yeah. Yay! She liked it! Even my normally non-stuffing loving husband liked it. I couldn't believe how incredibly EASY it was to make and simple the ingredients are. First, I bough a cheap loaf of white bread at the store...I call this stuff "duck" bread because we feed it to the ducks. Next time, I'm making the good stuff. Challah. Sourdough. Cornbread. I can imagine the possibilities! Cubed the bread into 1/2" chunks and spread it flat onto a baking sheet to dry. Now, you may be asking yourself, "Why dry the bread?" You are going to be adding a boatload of moist stuff and you do not want your bread to be soggy! (1) Overnight. If you've got pets, hide your bread crumbs in the (turned off) oven! (2) In a 300°F oven for 10-15 minutes, stirring twice, then cool. Bread will continue to dry as it cools. (3) Dehydrating. I chose this option. I turn my convection oven to the dehydrate setting and it was done in 1 hour. You could skip the whole bread drying thing and go for plain croutons. My sister in law told me that Kneaders is saving the ends of their breads, bagging them and selling them to their customers. 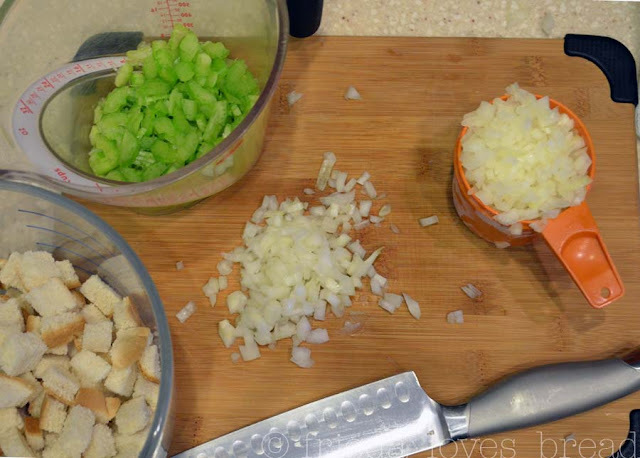 Chop up some onions celery. Easy, right? 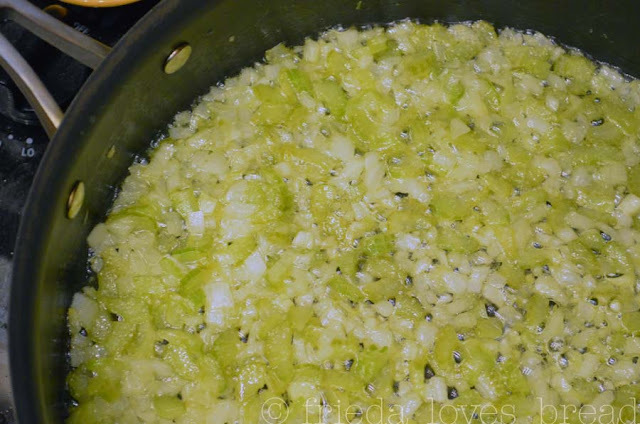 Melt some butter in a skillet and cook the onions/celery till soft and tender. There's no right or wrong way to do this ... my mom sprinkles the poultry seasoning onto the bread crumbs. I decided to throw it into this buttery mixture! You can add salt, it depends on your chicken stock. I opted to leave it out and it tasted great! Put the bread crumbs and onion mixture into a large bowl. Drizzle 1 1/2 - 2 cups chicken stock, making sure you coat EVERY crumb for a moist, tender stuffing. Pour mixture into a buttered baking dish. I drizzled the top with 1/2 cup chicken stock and covered the pan with foil. Uncover and bake for 15 minutes to crisp up the top. I love the combo of moist, savory, and crispy! Thanks for sharing! I am on the hunt for a stuffing recipe and my hubby is a no frills kinda guy - so this one sounds perfect! 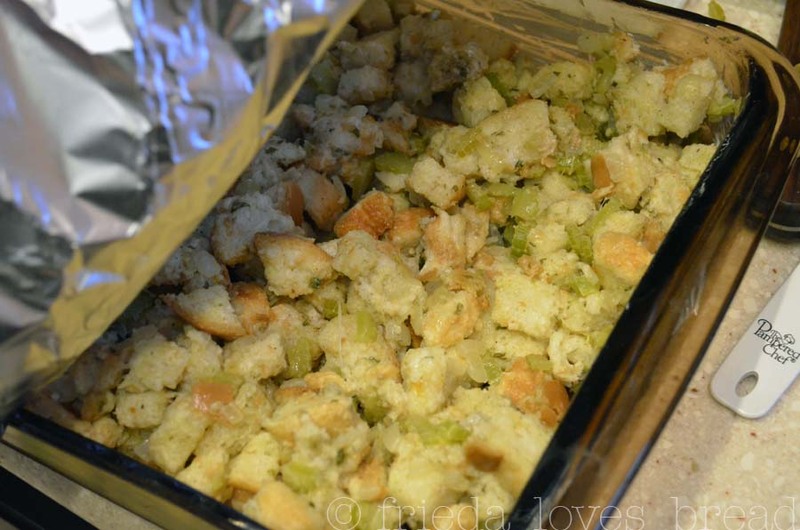 YES, thank you for sharing... Ditching the box must make the stuffing/dressing that much more lovely! And yours looks spot on. Wishing you & yours a terrific holiday! OH man. Now I'm hungry. Thanks. This is very similar to the stuffing we make every year. My husband likes it very traditional. I find that toasting the bread really does make a big difference in the final texture of the stuffing. Have a great Thanksgiving! Wow is all I can say. Looks wonderful and I can smell it now. Delicious. Come visit us. We have a terrific mulled cider and a legacy cookbook. We make stuffing the same way, but add some sausage to the mixture. Yummers! 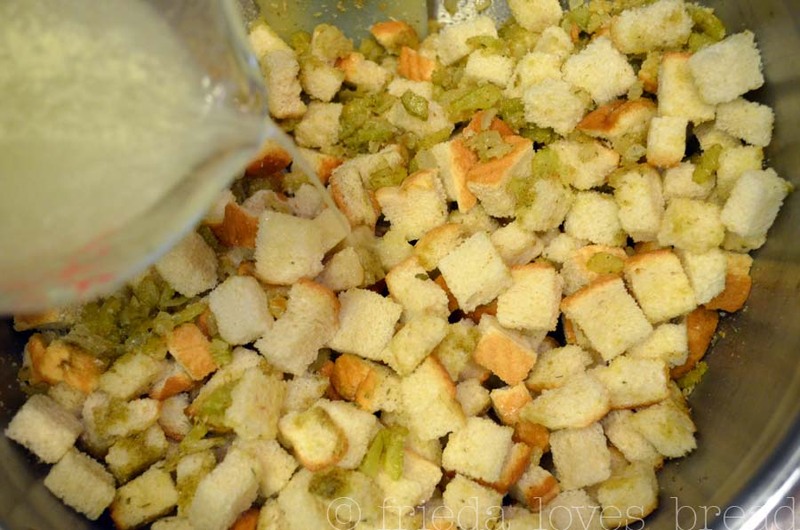 Now THIS is the true old fashioned grandmother stuffing mine made on the farm and it is wonderful the next day served cold or warm as a leftover! Thanks for this true classic! From an Iowa - raised girl!